Stainless steel lines are one of the best upgrades to a braking system, to improve feel. 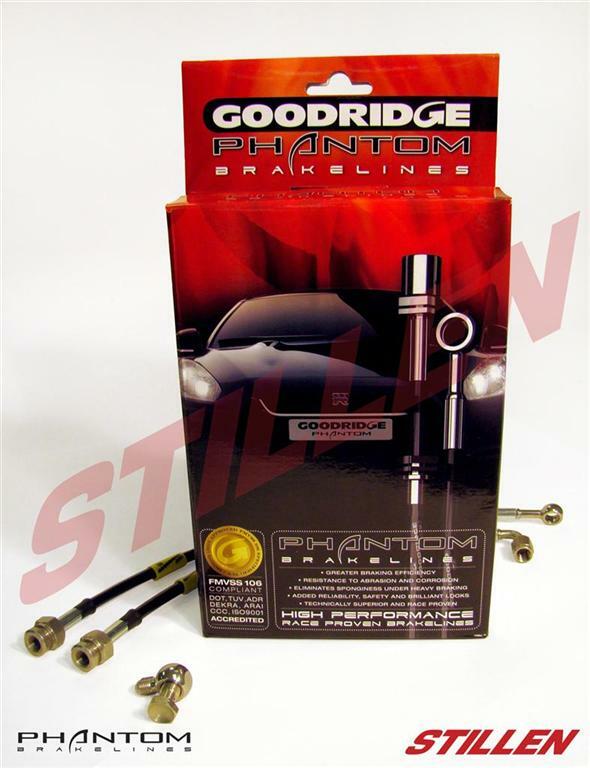 OEM brake lines are made of rubber, and expand a small amount during use. A stainless steel line does not expand like a rubber hose, and also helps to reduce water absorption though the OEM rubber lines. The Phantom G-Stop kits take that performance and kick it up a notch, utilizing stainless hose ends, banjos and bolts, as well as feature black poly-coating to the stainless steel hoses. Even the brackets and hardware are protective coated, creating a superior appearance, and ensuring durability. All of the benefits of the best brakeline manufacturer, Goodridge, with upgraded hardware and coatings makes this a great modification for any enthusiast!